Laser has become the treatment of choice. 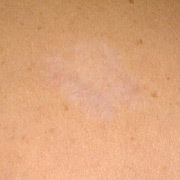 Laser Tattoo Removal Lasers target tattoo ink and rapidly heat it. Heat causes ink to expand and break up into smaller particles. The body is able to then absorb the small ink fragments and carry them away. Treatments are associated with mild discomfort, not unlike a small rubber band snapping against skin. The discomfort is well tolerated when small areas are treated, but if large areas are treated, discomfort may interfere with the procedure. Discomfort can be minimized by the use of ice, sedatives, pain medications, or injections of local anesthetic. Each laser targets a different family of colors. To completely remove a family of colors, two to four sessions may be required. Because most tattoos are comprised of multiple color families, several lasers may be required. 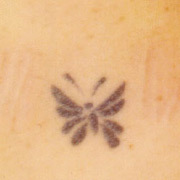 Some tattoos required 15 to 20 laser treatments for complete removal. Many other factors determine the number of treatments necessary.